So what is it like to blog about things that... just don't evoke any emotions, positive or negative? I'll tell you, and I'm probably not alone with this opinion: it's an absolute, brain-freezing writer's block. And that's exactly the reaction I get out of the two recent Sherlock Holmes films directed by Guy Ritchie, so bear with me when I try to "make bricks without clay", as the great detective himself might have said. This post has been in the draft stage for ages. Anyone who has paid the least bit of attention to current trends in the entertainment world will know that we are living in a fairly recent but extremely productive wave of Sherlock Holmes zeal. We now have two modern interpretations of Mr Holmes sleuthing away on both sides of the Atlantic Ocean, and an older version played by Sir Ian McKellen to look forward to next year. However, the first notable take on Holmes' adventures on the 21st century screen was the big-budget blockbuster Sherlock Holmes of 2009, directed by Guy Ritchie and starring Robert Downey Jr. and Jude Law as Holmes and Watson. A sequel, A Game of Shadows, soon followed, and we might expect a trilogy-fication to this franchise some day. I saw the first film before reading any of Sir Arthur Conan Doyle's works, but it was quite interesting to see that when I did read a couple of those books and short stories and then watched both films, it didn't really affect how I viewed them. The experience was equally non-plussing both times! Most people whose reviews I've read seem to find A Game of Shadows an improvement from Sherlock Holmes – I disagree. For me, the first film was a generally bland experience with a couple of good things going for it, and the sequel was just unremarkable in every respect. Let me explain why. 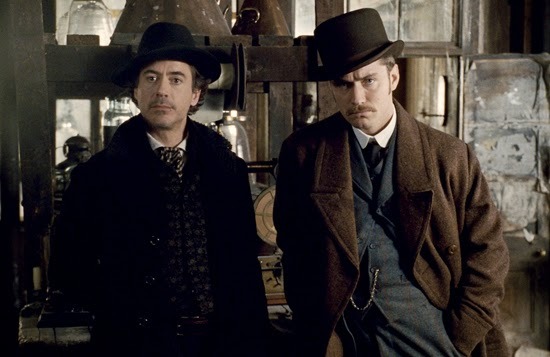 The main characters are, of course, the same in both films: Sherlock Holmes and Dr Watson, portrayed by Robert Downey Jr. and Jude Law respectively. Well, even before I'd read any of the original stories which would have provided me with expectations as to what Sherlock Holmes was "supposed to be like", I wasn't really buying Downey Jr. as Holmes. I would assume that even a person who knows nothing about this character would expect to see someone very British with a remarkable skill of observation, and Downey Jr. doesn't really deliver any of this. My main issue is not the fact that these films have re-imagined the character as more action-oriented and physically capable – I was just confused that they so absolutely under-used Holmes' celebrated intellect! The only scenes where I can truly remember him being the smartest person in the crowd was the boxing scene in the first film where he predicts his opponent's moves, and the final confrontation with Moriarty in A Game of Shadows which is a little too similar, except that Moriarty can do the same trick as well. Does nobody else find it weird that in the first film, instead of using his deductive powers to figure out what happened, he does some psycho pentagram-and-drugs ritual and apparently finds the solution in... I don't know, some drug-induced higher consciousness? Doesn't that kind of go against the very essence of what makes the character of Sherlock Holmes so special? Now I do admit that I am very partial to Jude Law. I actually like it very much that Dr Watson in these films is close to Holmes' equal in terms of age and useful skills – instead of the cuddly older man he's usually portrayed as, or a Nigel Bruce dunderhead for goodness' sake. Until Sherlock came up and gave us the gift of Martin Freeman's Watson, I think this kind of an approach was quite unique in Holmesian adaptations. Downey Jr. and Law also work really well together, even when their exploits are a bit too messy and over-the-top for my liking. Of course the boys are allowed to have fun and be bros on their adventures, but these films generate suspense out of the numerous, massively special-effectful action sequences rather than the mystery of the case at hand. This is especially apparent in A Game of Shadows where we get the interminably long train ride which includes a clown-makeup-wearing Holmes, and a likewise interminable chase through the woods which seems to take especially long because of all the slow-mo. Both of the films have their sinister villain and their obligatory filler female character, and I think the first film has the better one in both departments. 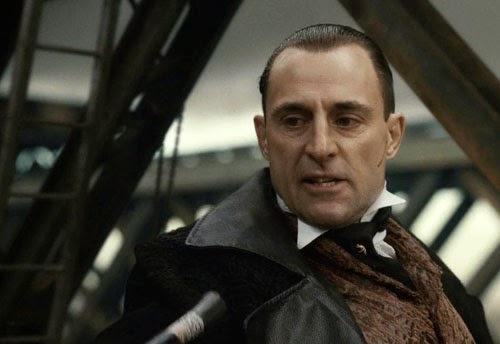 While I'm not entirely convinced that a society of dark magic works especially well as a villain entity against Sherlock Holmes, Mark Strong's Lord Blackwood makes my blood freeze. 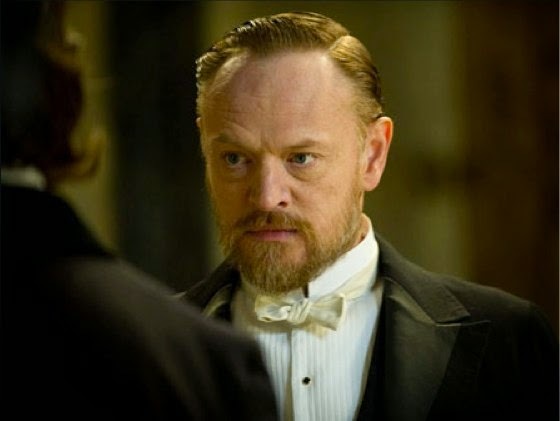 In A Game of Shadows we're then given Professor Moriarty – Holmes' The Enemy – and I couldn't figure out why I was expected to be especially apprehensive or impressed about the character Jared Harris was playing. In the best hero/villain constructions, I find that the opponents often have some vital element in common which is a source of attraction as well as disdain for them both – the more subtle the mirror effect is the better, but it's definitely there. However, this film's Sherlock Holmes and Professor Moriarty don't have much anything in common, no reason at all why they would share this kind of a bond. As for the obligatory filler women in both films – yes, I'm going to call them that. They seem to exist for the sole purpose of avoiding criticism about a male-heavy cast, and the plot would very well survive without them. Irene Adler is better served in the first film in terms of "getting to do stuff", but the character is both unremarkably portrayed by Rachel McAdams and written in the most unimaginative manner possible – she's Holmes' ex-girlfriend. Even before I read A Scandal in Bohemia, this treatment had a suspicious "easy way out" feel about it. In A Game of Shadows, the female lead is taken over by Noomi Rapace, and I want to make sure you know she's actually a very impressive actress. However, as Madame Simza her main function is to say a couple of Gypsy-stereotypical lines about the power of Tarot cards and have a problematic brother. I love her costumes, though. Kelly Reilly's Mary Morstan Watson, who appears on both films, has no personality at all, except perhaps a slightly annoying one. However, I was positively surprised at how she was involved in the resolution for A Game of Shadows. These films are never abundant in exquisitely clever plot twists, but that one at least came close. In both of these films, I like the music and the production design very much. Hans Zimmer's music is very atmospheric and suspenseful, with a feeling of adventure and mystery. I find myself quite immersed in the Victorian setting, which is a bit dark and gritty and includes other layers of society besides top hatted gentlemen and hoop-skirted ladies. There is so much more to this long era in English history than Victorian values and a perpetually mourning queen; for example, great technological advancement, which is handled in both films. Of course, a World War geek like me would get excited about the WWI foreshadowing in A Game of Shadows, even though I spent the rest of the film battling with my attention span. I just don't see why the solution for marketing Holmes and Watson to a new generation would have to be "make Sherlock Holmes an ungroomed, badass action hero and blow stuff up". Why does the Great Detective have to be dumbed down? Why do we need elaborate action sequences at the cost of a well-balanced, properly contained plot? The steadily expanding part of my brain that is possessed by the "nitpicker of dramatic structure" personality is especially peeved by the fact that Holmes fake-dies twice in A Game of Shadows, twice in the space of one movie which frankly isn't otherwise very interested in providing emotional, character-building moments! Then we have to watch Dr Watson being devastated over the loss of his friend, twice, knowing perfectly well that Holmes is going to jump back up any minute. Lord Blackwood's fake death in the first film has much more weight and purpose to it, and when he dies for real it happens on an awesome, half-constructed Tower Bridge. Have I told you before that my love affair with London began from seeing a picture of Tower Bridge? So, I hope I've provided something of an explanation to why I find Guy Ritchie's take on Sherlock Holmes so unremarkable, and why I was more bored watching A Game of Shadows than watching the first film. What about you? Is an action film portrayal of the Great Detective refreshing or blasphemous in your opinion, unless it's something in between? Do you like one film more than the other? Do you want to see a third film in this franchise? Do you feel like ranting in defense of or against Downey Jr.'s British accent? There was an unexpected couple of days' gap in my Sherlockian blog posts, but now that I'm back in business there are still two more similarly themed blog posts to come. I'm going to do a joint review of A Study in Scarlet and The Sign of Four and finish off by mercilessly pitting Sherlock and Elementary against each other while having a shameful amount of fun doing so. It's been great to see how willingly and insightfully you readers comment about Holmesian things, and I sincerely invite you to continue doing so, perhaps even after I'm finished (for the time being) with this theme! I just don't see why the solution for marketing Holmes and Watson to a new generation would have to be "make Sherlock Holmes an ungroomed, badass action hero and blow stuff up". I don't see why we would need another Sherlock Holmes exactly like the excellent film Holmeses we've already got. So if they wanted to make a new movie about him, why not make it actually new and different? That's a good point. I do agree with you that if you're going to re-interpret a well-known canon, you have to do something fresh and interesting with it. I just find that the smartest adaptations manage to be interesting while also maintaining the basic elements of what people love about the original. To sum up: the 2009 film isn't a spectacular adaptation like the BBC version but I'd take it over Elementary any day. I wanted to ask about Downey's accent because a big part of the Internet is raging about how inaccurate he sounds, but I never found much fault in it myself and I have a very sensitive ear for English accents even though I'm a Finn. I've watched the first film a couple of times and I just go kind of "meh" every time. No unseen depths to be discovered there, really. Irish and Australian actors always seem to do brilliant English accents but American actors not so much! I think RDJ's English accent is one of the better attempts that I've heard from an American actor but there are moments in these films when I can tell that he's having to think about what he's saying. When it comes to American actors doing English accents I think Johnny Depp is the best. I am one of those who think 'A Game of Shadows' a big improvement compared to the first film. But it just might be because after the giant deception of the first film it couldn't get worse and I was finally rather pleasantly surprised by the second. I really don't like Holmes' representation in these films and I share the same interrogations as you on the matter. I also don't understand why so much noise, so many explosions ? I find it makes the film very tiring to watch and it tends to give me a headache. In fact, the main positive aspect for me in these films is that I really, really like Jude Law 's Doctor Watson. I read your review on these films and we seem to think very much alike. I get really annoyed at flashy action scenes too, it just gets immensely boring if there's too many of those in one film – and that's my main complaint with A Game of Shadows. P.S. I write poems, btw. It would be great if u could read them, and let me know how I am doing.